Make sure everyone who is working in the laboratory knows the locations of fire extinguishers, manual pull stations, eyewash stations, shower stalls, telephones and alarms. Make sure authorized personnel know how to operate the fire extinguisher and the eye wash and emergency shower station. Large or dangerous spills are classified as spills that present any immediate danger – including fire, explosion, chemical exposure, and/or toxic fumes. Dangerous spills are also classified as any spill that contains highly dangerous chemicals, or moderately large-scale chemical spills. Smaller spills can be very dangerous too. This all depends on how toxic the chemical is. Many smaller spills can be contained and cleaned up by lab personnel, without putting themselves or others in danger. Before cleaning a spill, make sure the chemical’s properties are not toxic, combustible, flammable or explosive. Follow the emergency guide’s instructions for dealing with dangerous chemical spills. Avoid breathing in toxic fumes or vapors. Alert people in the surrounding areas, and all personnel inside the laboratory or facility. If the spill involves flammable storage, liquid or solid, turn off all ignition sources, if possible to do so safely. Evacuate the facility, closing all doors. Keep people away from the spill area until emergency responders have arrived at the scene. 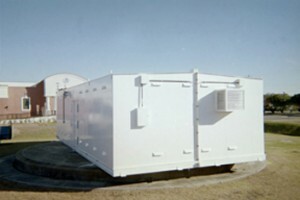 Manage chemical storage properly with a flammable storage laboratory from US Chemical Storage. Industry leading technology and superior strength to ensure your personnel, investments and facility will remain safe in the event of a chemical spill. Fire rated for complete protection. Choose from 2 hour fire rated or 4 hour fire rated flammable storage laboratories to store your chemicals compliantly. Customize your fire rated chemical storage laboratory with our optional accessories. Choose from mechanical ventilation, cooling systems, heating systems, freezer and refrigeration units, alarms, sensors and more. Professionally engineered built by our experienced, certified welders for quality assurance and ultimate durability. Get Compliant with US Chemical Storage.